Lots of things to cover today and I only have about 20 minutes to crank out this post. So bear with me. This, my dear readers, is a speed post. First things first: I am officially in fall mode. I have been wearing a scarf every day for the past week. That’s indicator #1 of fall weather. #2 is that I’m wearing pants. I hate pants. But now is the time for pants. #3 I am drinking hot beverages by choice. 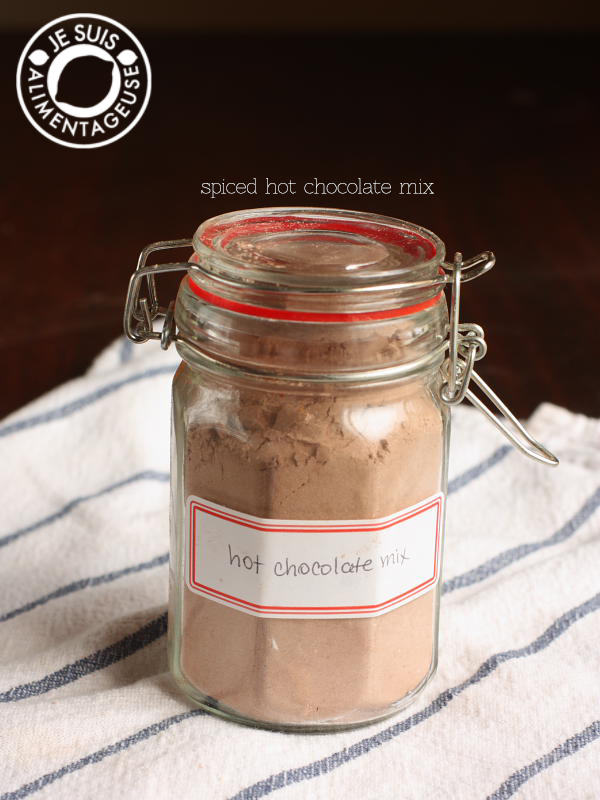 And this spiced hot chocolate mix is definitely something I would drink more than once a day by choice. Before I lose my lovely vegan readers (according to my reader survey, there are LOTS OF YOU! <3), I’d like to reassure you that this mix is perfectly vegan, so there’s no dairy and no trace of animal by-products (three cheers for bone-free sugar refinement). Third thing to mention in my post: today’s theme for Weight Loss Wednesday is about sleep. And maintaining a sleep schedule. Now I don’t know about you, but I am a student with night classes and a blogger by day. Most things for me don’t start until around 2 pm, and then my classes often go until 9. That means I get my creative juices flowing typically by 11 pm, and that’s when I’m more productive. This usually equates to Lisa staying up until 3 am and then waking up around 10 am to exercise, shower, get ready for the day, work on the blog/take photos with the daylight, then start working or going to school. Sometimes I have to wake up earlier, sometimes later, but the fact that I’m not even tired until at least 2 am is a little messed up. I’ve been trying to go to sleep earlier, but there’s just so much to be done! How on Earth do we survive with just 24 hours a day? There are so many things to do. I feel like there’s an unending to-do list for my life, and I don’t even have kids. I can’t even imagine blogging with kids. My goodness, mommy bloggers, you have my respect. So for today’s WLW, I ask you, how do YOU maintain a regular sleep schedule with so many things to do in a day? I would say I have a plan but I honestly have no idea. Sometimes I find I fall asleep on the subway and then I’m constantly afraid I’ll start drooling or snoring. Yikes. But back to hot chocolate. Yes, hot chocolate is classic. I’ve made beautiful, thick and lusciousÂ Italian hot chocolate, but it’s so rich that it’s not a treat I can make every day. Now this, I can make everyday. Just heat up some milk, add a few spoonfuls of the mix, and I have an easy, wonderful, fall drink. It’s perfect for those days where you accidentally underdressed, and you’re chilled even when you get home and curl up in a blanket. Yes. Yes, my dear friends. This is good. You can also bottle this stuff up for gifts, because as you know, the holidays are coming and with holidays, come potlucks, gatherings, and times where you can’t just walk into someone’s home empty-handed. Sure wine is great. But spiced hot chocolate? Sift all ingredients together and mix until homogenous. To make the hot chocolate, heat 1 cup of milk or milk alternative (I LOVED it with unsweetened almond milk) and whisk in 5 heaping tablespoons of the hot chocolate mix. Heat until desired temperature (I did it until there was lots of steam coming up while whisking but I didn't bring it to a boil. Yes! I can't wait to try this recipe... it would be perfect right now, as I am freeeeeezing. Good luck on finding more sleep. I feel like no matter what stage you are in, it's always somehow a challenge! Aw thank you so much for the comment! My mom mentioned that you became vegan, please feel free to comment on how a recipe turned out =) I would love to know. Take care! Ooo, this is great! I have some friends who might just be getting this for Christmas! I'm fifteen and I'm a vegetarian. So I'm not in my twenties and Ido not have a child. Lol. BUT YOUR POSTS ARE AWESOME. So thanks. LOL haha well good to know. Thanks Lydia! I've just made this mix, and tried it, and wow, it's amazing! I added a little extra cayenne pepper because I liked it spicy, and it is so warming! Delicious. Going to make all of my friends some for Christmas and put it in little fancy jars :) Thanks for this recipe!